One of the most frequent questions I am asked is how I personally prevent and treat cold and flu. So, here is my guide to how to BEAT THE BUG! Starting in the fall, I participate in Kew Beach Naturopathic Clinic’s Homeopathic Flu Prevention Program, which involves taking a homeopathic remedy once per month to prevent the flu. As soon as I feel a little under the weather, I do all 4 of my simple steps to beat the bug as listed below and continue until I feel better. I treat myself with my Immune Boost Program, using herbs and/or UNDA remedies specific to my symptoms. Every year, Kew Beach Naturopathic Clinic offers Homeopathic Flu Prevention. For more details, check out our blog here. 4 simple steps to beat the bug! How you treat minor illness like cold and flu is an important part of your overall health and immune function. Before reaching for suppressive medications, support your immune system to prevent illness and get better faster by following the steps below. Did you know that sugar suppresses the immune system and increases your susceptibility to infection? If you are feeling under the weather, avoid all sources of sugar immediately and for at least 3 days. My favourites are vitamin D, probiotics, and zinc all winter. You can also gargle with a bit of oil of oregano in water if you feel a sore throat coming. Talk to your Naturopathic Doctor about what supplements and herbs can help prevent illness and are most indicated for you. Do all these before bed and you’ll rest well and likely wake up feeling better! Dissolve ¼ teaspoon non-iodized salt in 1 cup warm water in a neti pot. Over a sink, nestle spout gently just inside one nostril. Breathe through your mouth as you lean forward, tilt your head up on the side of the neti pot, and pour the liquid into your nostril. A stream of water should come out through the opposite nostril. You can use the entire neti pot in one nostril or just half. When you have finished on one side, blow your nose and switch sides. I do this every day and it is great for circulation, reducing aches and pains, and improving temperature regulation. Begin shower with 2-3 minutes warm/hot water all over. Switch to cold water for approximately 30 seconds. Repeat steps 1 and 2 at least twice more, for a total of 3 (or more) cycles. Always end with cold water. Great for congestion and chronically cold feet. Soak a pair of cotton socks in ice water, then wring out socks and put on. Put on dry wool socks over the wet cotton socks. Avoid walking in the socks as this will cause the wool socks to get damp. Go to bed. Your feet will quickly warm and dry the cotton socks – remove the socks once they are dry. Aim for at least 8 hours sleep, more if possible. Don’t hesitate to call in sick for at least 1 day if necessary – this may be all you need and saves you from a long, drawn out illness! 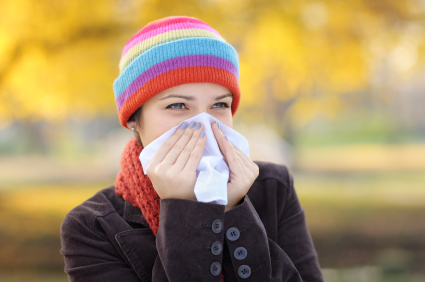 Do you dread cold and flu season? Does every sore throat, cough, or stuffy nose linger or progress to a full-blown infection? While the steps above can help, you also need more personalized immune support to change this pattern. Get your immune system in shape this year by addressing prevention, symptom relief, self-care techniques, and reducing susceptibility to illness via my Immune Boost Program! Existing patients can book a follow-up visit to get started. New patients, please call one of my clinic locations to book and initial visit. 2 Responses to Beat the Bug! Just wanted to say thank you for promoting naturopathy in an intelligent and interesting way with your blog. Keep up the good work!